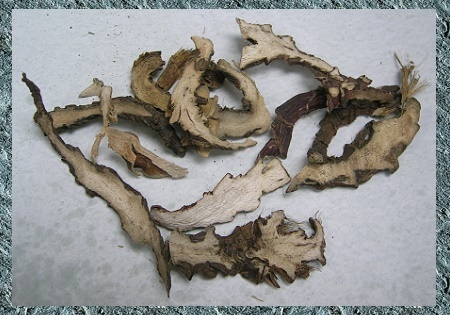 The dry rhizome of perennial herbaceous plant Acorus tatarinowii Schott. of family Araceae. South region of the Yangtze River in China. Fragrant smell, bitter and slightly pungent taste. Thick, off-white color in section and with strong fragrance. Pungent, bitter, warm; heart, spleen and stomach meridians entered. Induce resuscitation and refresh mind, resolve dampness and harmonize stomach, calm heart and induce tranquilization. It has relatively weaker strength in inducing resuscitation and refreshing mind, but with combining actions of resolving dampness and eliminating phlegm, so it is good at treating coma caused by phlegm-damp confusing orifices. For high fever, coma and delirium due to phlegm-heat confusing orifices, it is often combined with heat-clearing herbs and phlegm-resolving herbs. For instance, it is combined with Yu Jin, Zhi Zi and Zhu Li in Chang Pu Yu Jin Tang from Wen Bing Quan Shu (Complete book of Warm Diseases). With pungent aroma, it can resolve dampness and enliven spleen, harmonize stomach to help digestion. For treating stuffiness and fullness in abdomen and epigastrium, distending and oppression pain due to retention of dampness in middle energizer, it is often combined with damp-resolving herbs. For instance, it is combined with Sha Ren, Cang Zhu and Hou Po and so on. For fever, vomiting and diarrhea, fullness and stuffiness sensation in chest and epigastria with yellow and greasy tongue coating due to damp-heat accumulated in intestine and stomach. 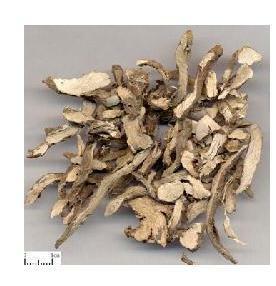 It's combined with heat-clearing and damp-drying herbs, such as with Huang Lian and Hou Po in Lian Po Yin from Huo Luan Lun. combined with other tranquilizers. For instance, it is always combined with Fu Ling and Yuan Zhi in An Shen Ding Zhi Wan from Yi Xue Xin Wu which is indicated for insomnia and palpitation, and Kai Xin San from Bei Ji Qian Jin Yao Fang indicated for amnesia. Decoct 5~10g. Take the double dose for fresh one. Take pills and powder.